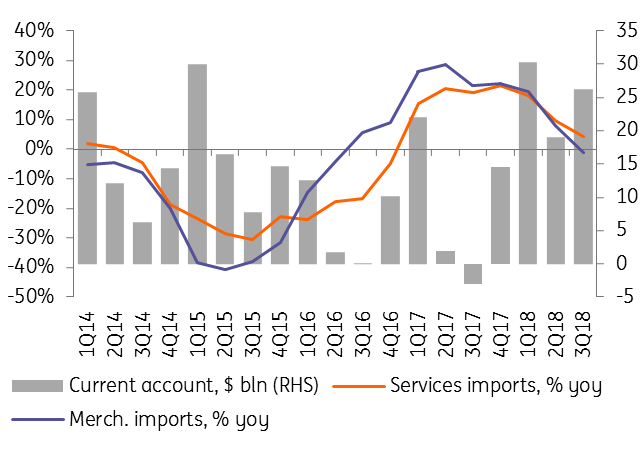 The current account surplus is better than we (US$20bn) and the market (US$24bn) expected for the quarter. The outperformance was caused not only by high oil prices, but also thanks to the downward pressure on imports - following the recent RUB depreciation - and a reduction in the current debt servicing payments. According to our estimates, should the average Brent price stay above US$75/bbl in 4Q18, the quarterly current account surplus may exceed US$30bn in 4Q18. This is potentially good news for the rouble in the short-term, as the Central Bank of Russia has put FX purchases on the open market on hold till year-end 2018, having purchased US$7bn in 3Q18. All else being equal, the current account suggests that USD/RUB has a chance of returning to RUB60-65 range in 4Q18. Overall, based on the headline 3Q18 BoP data our current RUB72/USD house view for year-end 2018 appears overly pessimistic. Yet the more constructive RUB60-65 range suggested by the current account is achievable only under the assumption that there is no material tightening in the sanction regime against Russia at least in the coming three months.